K. Hammond of Sittingbourne is based in the town of Sittingbourne, Kent. Ken Hammond founded the business in 1977 and takes a hands-on approach with all of the specialist work that is carried out in his workshop. With over 40 years of experience, we have overseen almost every type of major development within the automotive industry. And we have proved that we can adapt to these changes and work on anything from vintage, prestige, modern and everyday vehicles. There have been many changes to systems and processes of painting - from cellulose paints and 2k acrylics to today's water based systems - but K.Hammond has adapted to a changing automotive landscape and maintained an exceptional standard of service. We invest in the best new technologies to ensure you receive a first-class service time and time again. We listen to every customer’s requirement - whether it’s a respray, customisation, personal colour scheme, or body repair. One of our most unique areas of specialism is the spraying of motorcycles. Motorcycle resprays are done for a variety of reasons; maybe your paintwork has faded and is looking worse for wear; maybe your bike is peppered with stone chips, or maybe you have decided to go for a custom paint job or turn your motorcycle into a race replica. 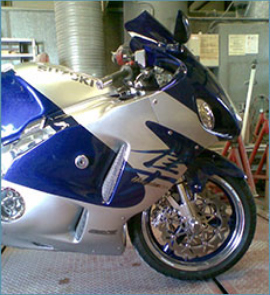 Whatever the reason for wanting respray and repair work - from a cracked fairing to a dented tank - we can respray your motorcycle to its original colour, custom colours, a race replica design, or a completely custom design. The other area of respraying that we excel in is the respraying of light commercial vans. Many businesses are now opting for magnetic graphics or printed vinyl wraps, and respraying is now a skill that is reasonably hard to come by. 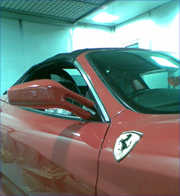 The finished result can be remarkably different, with a vinyl wrap prone to fading over time, peeling and, in some cases, badly fitted in the first place. Vinyl wraps can end up costing twice as much in the long run, as they cost the same amount to remove as they do to apply. If you choose to have a professional paint spray you are guaranteed to have a high-quality perfect finish that will really last. 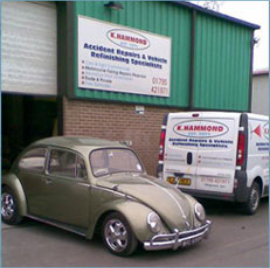 K.Hammond provides expert body repairs from our vehicle body shop in Sittingbourne . We work with all makes and models of cars; we repair every vehicle to the manufacturer’s specification, and are committed to offering you impartial and honest advice when it comes to the repair of crash damaged vehicles. What's more, we take an honest approach to insurance work; if you've been involved in an accident, it is your right to choose who you want to carry out the repairs and you are in no way obliged to use the insurance provider's appointed repairer.